Since 2005 the brewers of Samuel Adams have been offering drinkers a voice in choosing one of the new beers they will introduce in the coming year. 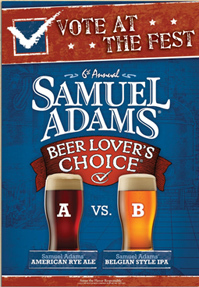 This summer the trend continues as the Boston Beer Company, the makers of Samuel Adams, will take two recipes on the road to be judged in a head-to-head consumer taste test. This summer the trend continues as the makers of Samuel Adams will take two recipes on the road to be judged in a head-to-head consumer taste test. Long Island’s North Fork Craft Beer, BBQ & Wine Festival will be among the first stops on the polling tour. “It may be the largest single event polling place for this year’s national competition,” said event producer Andy Calimano of Starfish Junction Productions. The festival will include a broad range of nationally recognized craft beer industry leaders as well as many of Long Island’s award-winning hometown favorites-more than 50 breweries in all. The event will feature wines for sampling from the Martha Clara Vineyards collection and other specially selected Long Island wineries. Gourmet barbeque from Maple Tree BBQ and live music from the band Energy Express will add to the enjoyment of the day. The event will help to raise funds for the Peconic Bay Medical Center as well as the Terry Farrell Firefighters Fund.